Chief Editor's Choice: Top 5 watches from Baselworld 2019. 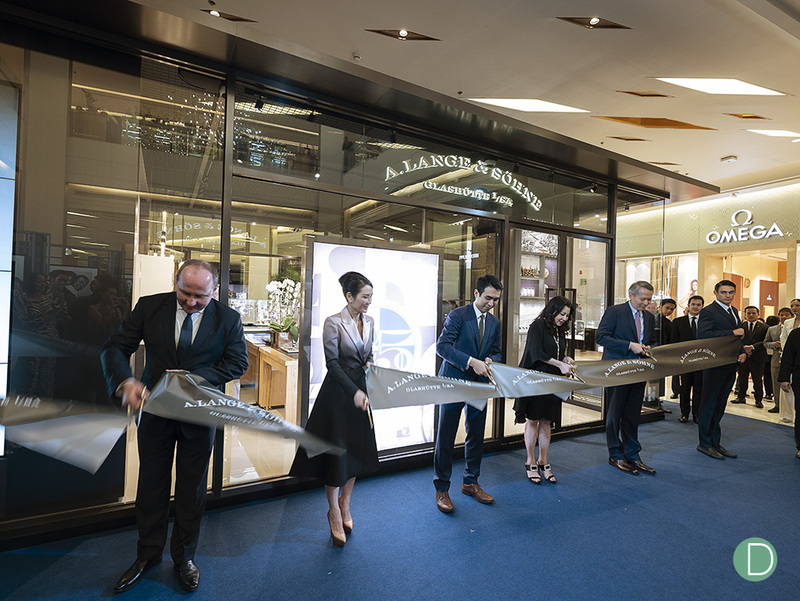 A. Lange & Söhne opened its second South-East Asian boutique in Bangkok, in December 2018. 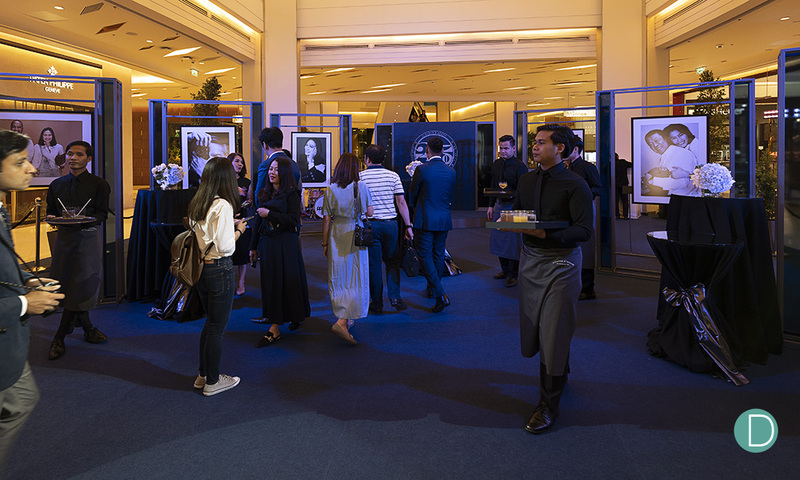 With a retail space of 50 square metres and a brand-new design concept, it is situated at the heart of the Thai capital on the main floor of siam Paragon, one of Bangkok’s largest shopping malls. We attended the Official Opening today in Bangkok and bring you this news. The new boutique boasts of a retail space of 50 square meters and a new design concept. 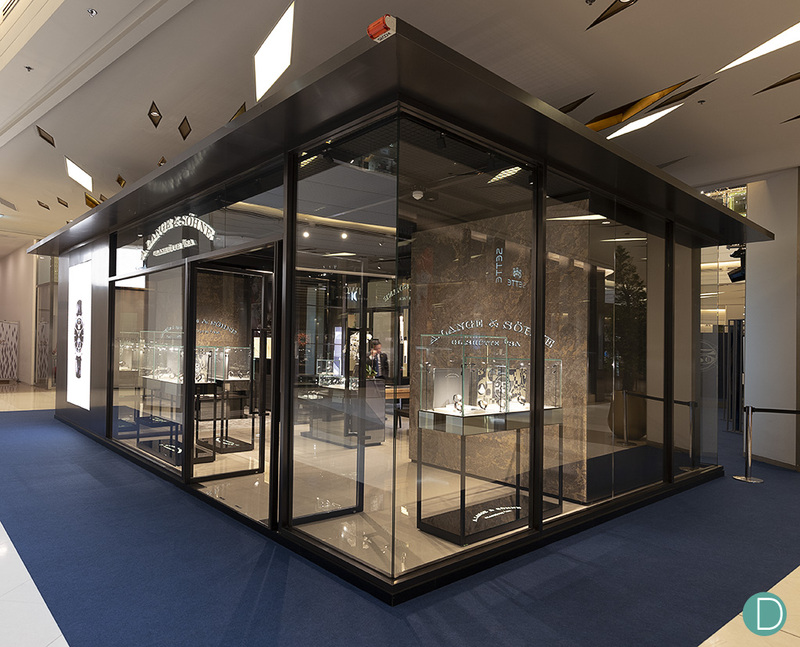 The brand’s first boutique in the region was in Singapore, which opened in 2012, and the latest in Bangkok features a free-standing, concept, offering a 360 degree visibility. Walter Lange, the great-grandson of Ferdinand Adolph Lange, who re-established A. Lange & Söhne in 1990 after an involuntary hiatus of over forty years. Guests mingling before the Grand Opening. The portraits on display are commissioned by Lange, and are of prominent local collectors. 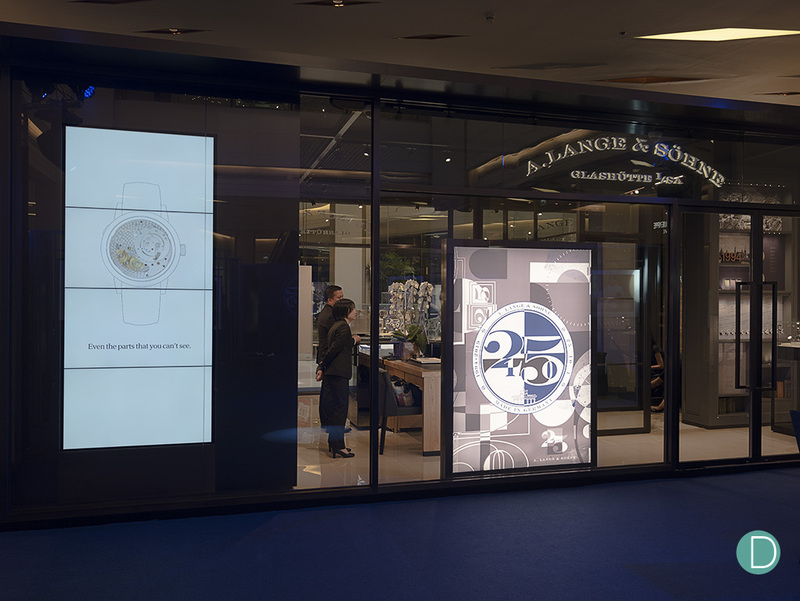 A. Lange & Söhne watches have always been well-regarded for their distinctive classicism and timeless quality. An interplay of colours, materials and surfaces helps achieve the unique look in their timepieces. The new boutique design concept draws on this strength and modernizes the manufactory’s global presence and image, while adding impressive aesthetic features. The company’s signature grey also gets a few new flourishes, including a shade that was specially developed for the A. Lange & Söhne boutiques, to match the traditional German Silver used in every movement – a unique, warm tone in between gold and silver. The boutiques’ clear lines and plenty of details are reminiscent of the history and values of the manufactory. 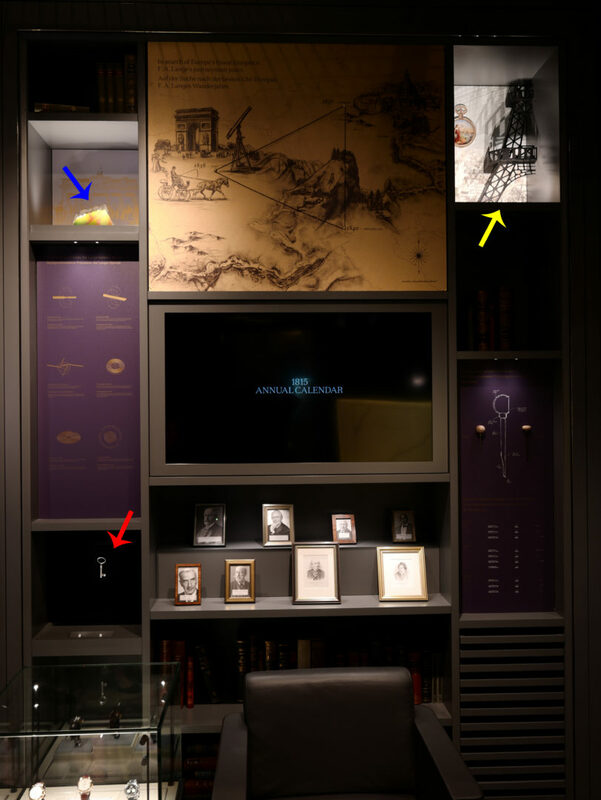 A small private room where customers can view the watches in privacy and comfort. Angular, interlocking spaces open up exciting perspectives and spatial experiences. Each space also fulfils a specific role, from watch display and consulting to sales talks. In addition, metal pilaster strips are featured on the wall fittings, adding visual highlights as well as making a statement about the typical characteristics of a Lange watch. Like the edge of watch components, the strips are bevelled at a 45° angle and polished, featuring straight-line graining on the inside – another finishing technique typical of watch components. Small details on this wall on the private room within the Boutique. The blue arrow is a piece of the Berlin wall, which was instrumental to the rebirth of Lange. The yellow arrow shows the Eiffel Tower, one of the locations where F.A. Lange journeyed to learn his trade. And the red arrow is the key (replica) to the post box during the GDR years when Lange became part of the state owned Glashutte Uhrenbetrieb. Mail to A. Lange & Söhne was deposited in the post box. A key aspect of the boutique is the lounge with its Experience Library. An oversized type case displaying numerous exhibits tell the story of the manufactory and its craftsmanship using lovingly designed objects. For both furnishing of the salesroom and the making of mechanical timepieces at the Lange manufactory, the company is guided by honest, meaningful and sustainable use of craft skills and materials. The designers and architects ensured maximum quality and optimum functionality and value with a timeless aesthetic appeal. 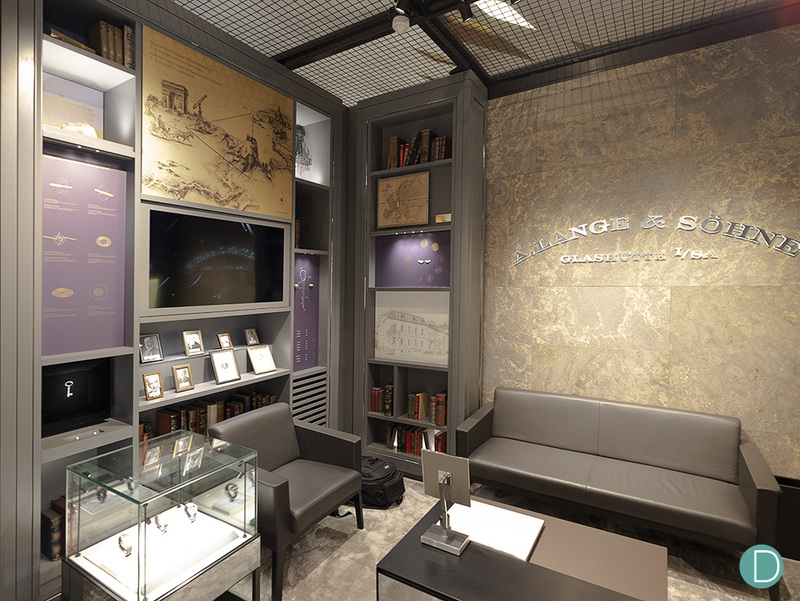 The Bangkok boutique is the 4th in the world to implement this new concept following Dresden, Shanghai and Chengdu.